It doesn’t look like spring as we look out of the office window, and we don’t feel ‘full of the joys of spring’ when walking Chairman Charlie(Dog) and the other Board Members in freezing wind, sleet and snow. 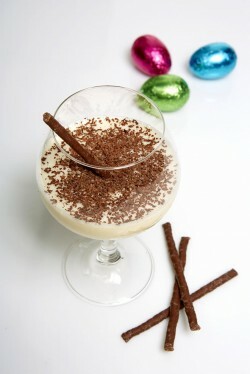 BUT, Easter is upon us – so here’s one of Shaken & Stirred‘s Easter Cocktails. Mix it up at home, from ingredients which you will find in most supermarkets… then light the fire, put a good film on and enjoy! 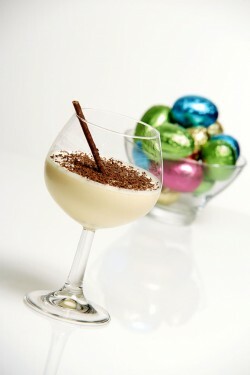 Shaken & Stirred’s Chocolate Easter Flip is a play on a classic ‘flip’, featured in the 1862 ‘Bon-Vivant’s Companion’. Created with delicious dark and intense chocolate liqueur and luxurious cognac, once shaken together with egg and cream the cocktail will have the froth that gives it the ‘Flip’ name. It’s a fabulously extravagant cocktail, perfect as a warming indulgence to sip over Easter – like drinking chocolate Easter eggs!